?This lively appreciation of one of the most intimidating and massive novels ever written should persuade many hesitant readers to try scaling the heights ofWar and Peace sooner rather than later? (Publishers Weekly). Considered by many critics the greatest novel ever written, War and Peace is also one of the most feared. And at 1,500 pages, it?s no wonder why. Still, in July 2009Newsweek put War and Peace at the top of its list of 100 great novels and a 2007 edition of theAARP Bulletin included the novel in their list of the top four books everybody should read by the age of fifty. ANew York Times survey from 2009 identified War and Peace as the world classic you?re most likely to find people reading on their subway commute to work. What might all thoseNewsweek devotees, senior citizens, and harried commuters see in a book about the Napoleonic Wars in the early 1800s?War and Peace is many things. It is a love story, a family saga, a war novel. But at its core it?s a novel about human beings attempting to create a meaningful life for themselves in a country torn apart by war, social change, political intrigue, and spiritual confusion. It is a mirror of our times. 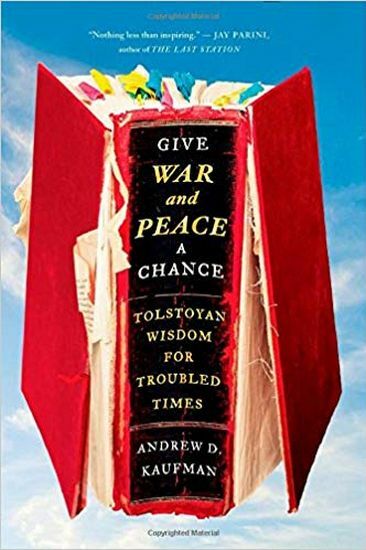 Give War and Peace a Chance takes readers on a journey through War and Peace that reframes their very understanding of what it means to live through troubled times and survive them. Touching on a broad range of topics, from courage to romance, parenting to death, Kaufman demonstrates how Tolstoy?s wisdom can help us live fuller, more meaningful lives. The ideal companion toWar and Peace, this book ?makes Tolstoy?s characters lively and palpable?and may well persuade readers to finally dive into one of the world?s most acclaimed?and daunting?novels? (Kirkus Reviews).